BONN (IDN) – Scientists are warning of a profound impact on human health and migration, leading to civil unrest and conflict. In a new statement to national representatives meeting in Bonn for the annual climate talks widely known as COP23, scientists said that Earth is approaching tipping points that threaten human security. The warning that Planet Earth is coming close to a critical situation – when a series of small climate changes would become significant enough to cause havoc – comes as global emissions are projected to rise after three stable years. COP23 is an abbreviation for the 23rd session of the Conference of Parties to the United Nations Framework Convention on Climate Change (UNFCCC) in the former West German capital city Bonn, from November 6 to 17. 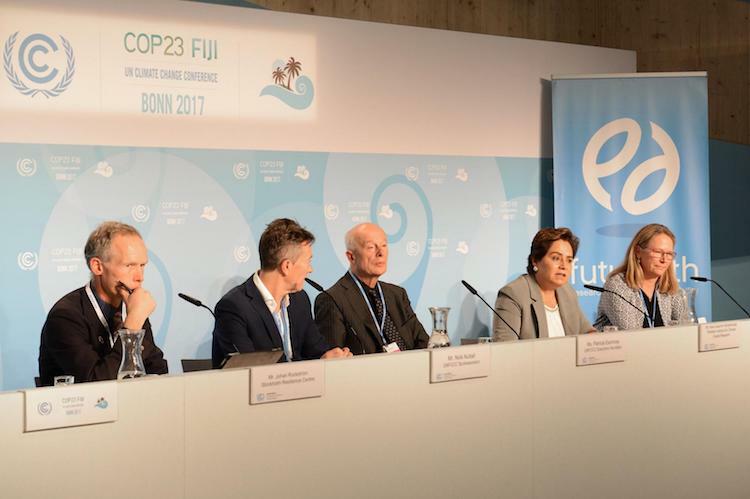 The statement, "the 10 Science 'Must Knows' on Climate Change", was presented to the UNFCCC Executive Secretary Patricia Espinosa on November 13 and distributed to climate negotiators from around the world in Bonn. It has been published by Future Earth and the Earth League, two major international organizations representing networks of global sustainability scientists, and summarizes recent Earth-system science and economic research. Professor Johan Rockström, executive director of the Stockholm Resilience Centre and Chair of The Earth League, an international network of scientists that co-produced the statement, said: "There is no room for complacency. Climate change is here. It is dangerous. And it is about to get much worse." "In the last two years evidence has accumulated that we are now on a collision course with tipping points in the Earth system," he added, underscoring the need for rapid action. According to Dr. Amy Luers, executive director of Future Earth, "The news that emissions are rising after the three year hiatus is a giant leap backwards for humankind." "Pushing Earth closer to tipping points is deeply concerning. Emissions need to peak soon and approach zero by 2050. Fortunately, we now have the tools to transition to a low carbon world while increasing energy security, improving human health, and strengthening economies," Luers added. Earth League member and director of the Potsdam Institute for Climate Impact Research (PIK), Hans Joachim Schellnhuber, said: "Some crucial climate-change facts tend to get lost in the noise of daily deliberations – even at an event such as the UN climate summit. It is important therefore to remind everyone of the very reason why ten thousands of people meet in Bonn: "unprecedented risk to humanity due to global warming, as revealed by science," he said. "This must be the starting point for re-thinking what in the past 70 years has become our culture of short-term convenience and consumption, a culture which eventually comes at the cost of the well-being of present and futures generations across the world," Schellnhuber added. 1 - Much evidence suggests that the planet has entered a new geologic epoch—called the Anthropocene. The rate of change of the Earth system is accelerating as a result of humans’ impact on the planet’s biology, chemistry, and physics. Earth’s climate has been remarkably stable since before the dawn of civilization. This stability is at risk. 2 - Earth is approaching critical “tipping points”. By crossing these thresholds, the planet may see abrupt, and possibly irreversible, shifts in the workings of the Arctic, Amazon, and other parts of the globe. 3 - The record-breaking 2017 Atlantic hurricane season provides a glimpse at the increased risks of extreme weather events that the planet may experience in the future. These events include severe flooding, heat waves and droughts. 4 - Changes are occurring quickly in the ocean, with accelerating sea-level rise and ocean acidification. 5 - The economic costs of climate change are already being felt, and the some of the world’s poorest nations are bearing the heaviest burden. 6 - Climate change will have a profound impact on human health by placing new pressures on the food and water security in nations around the world. 7 - Climate change is likely to exacerbate migration, civil unrest and even conflict. In 2015, more than 19 million people globally were displaced by natural disasters and extreme weather events, and climate change will likely cause that number to grow. 8 - The world needs to act fast: If humans continue to emit greenhouse gases at current rates, the remaining carbon budget to reduce risk of exceeding the 2 degrees Celsius target will be exhausted in around 20 years. Emissions should peak by 2020 and approach zero by around 2050 if the world is serious about reducing risk. As a simple rule of thumb, this means halving global emissions every decade. 9 - A fossil-fuel free society is economically attractive: renewable energy sources increasingly compete with fossil fuels, even when these are priced at historic lows. Moreover, the estimated costs of inaction range from 2-10% of GDP by 2100 by some estimates, to a fall in projected global output by 23% in 2100 in others.